Sen. Ben Sasse (R., Neb.) on Monday slammed an American Bar Association (ABA) report that rated a former chief deputy attorney general for the state of Nebraska as "not qualified" for a federal judgeship. President Donald Trump nominated Leonard Steven Grasz for the U.S. Eighth Circuit Court of Appeals, but he is facing resistance that Sasse considers politically motivated, Politico reports. Sasse blamed the ABA committee for altering its usual standards to in order to undermine Grasz. "It’s sad that the ABA would contort their ratings process to try to tarnish Steve’s professional reputation in order to drive a political agenda," Sasse told Politico. 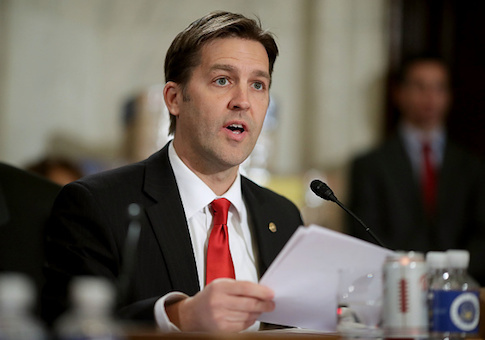 "In more than a decade as Chief Deputy Attorney General, whether he was litigating cases before the U.S. Supreme Court in Washington or the Nebraska Supreme Court in Lincoln, Republicans and Democrats alike knew that Steve represented Nebraska with integrity and professionalism," Sasse added. "He’s a Nebraskan through and through and he knows that under our Constitution judges don’t write laws but rule fairly on the facts of each case." Pamela A. Bresnahan signed a letter on Monday from the ABA’s Standing Committee on the Federal Judiciary declaring Grasz unqualified, and she also released a statement of the committee’s reasoning. Bresnahan alleged that Grasz’s pro-life views create a "lack of objectivity" that disqualify him from the position, pointing to his critiques of past Supreme Court cases such as Roe v. Wade and Planned Parenthood v. Casey. "Many questioned whether Mr. Grasz would be able to detach himself from his deeply-held social agenda and political loyalty to be able to judge objectively, with compassion and without bias," Bresnahan wrote about people interviewed for the report. "Also troubling was that Mr. Grasz maintains that his own pro-life agenda has no impact on his conclusion as to how a lower court could and should have avoided Roe and Casey," Bresnahan added. "He was unable to identify the lack of objectivity that his personal convictions had created." "In sum, the evaluators and the Committee found that temperament issues, particularly bias and lack of open-mindedness, were problematic," Bresnahan wrote in the conclusion. Sen. Deb Fischer (R., Neb.) also came to Grasz’s defense. She said in a statement that Grasz is "highly respected by a bipartisan group of Nebraskans" and noted that the Nebraska Supreme Court deems him to be in "good standing with the state’s bar association." This entry was posted in Politics and tagged Ben Sasse, Trump Administration. Bookmark the permalink.